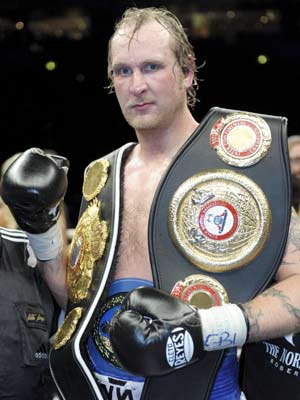 Heavyweight Robert Helenius, 19-0, is again sidelined with a hand injury and according to news from boxen.com, Sauerland’s website, Helenius must rest his right hand for six weeks. However, there are rumors of a worse injury and a layoff of up to six months. There must also be questions asked to when the hand was injured. Anyone who saw Helenius fight Michael Sprott March 23 in Magdeburg could tell that this wasn’t the Nordic Nightmare that stopped the likes of Sergey Lyakhovski, Samuel Peter or Lamont Brewster and he didn´t use his devastating right hand at any time during the fight against Sprott. Sprott even stated afterwards that Helenius’ stablemate Edmund Gerber punches harder than Robert - something most experts would dispute. The Nordic Nightmare himself confirmed after the fight problems with the right hand and said it was allright in training but hurting during fights and that he needed more treatment and therapy. EU jr middle champ Jackson Osei Bonsu’s defence of the title May 31 in Antwerp against Italian Giuseppe Langella is postponed or cancelled. "Sugar" Jackson, 43-7-1, was first to defend the title against Spanish champ Ivan Sanchez but the Spaniard was forced to pull out due to injuries and Italian Giuseppe Langella was contracted. Jackson then fought a non-title eight-rounder against Frank Haroche Horta, 31-10-5, a good boxer but light puncher, and was stopped in two and that put his career in danger. Osei Bonsu was always a devastating puncher with either hand but also with a fragile chin and now there appears to be problems with his recuperative power. Trainer and manager Renald De Vulder states that he wants "a 100% clearance from the doctors and a 200% motivation from Jackson is necessary if his career is to continue". 27-year old Norwegian featherweight Andreas Evensen, 17-3-1, have decided to retire. Evensen was last seen challenging EBU champ Alex Miskirtchian and was stopped in the 12th and final round and while the fight was hardfought and relatively even Andreas looked at the end like the victim of a traffic victim. Previously, Evensen won over Willie Casey in WBA I/C fight but was badly busted up in that fight as well. Evensen also lost to WBO jr light champ Ricky Burns. Andreas was throughout his career managed and trained Helge Waeroy and Waeroy´s methods have been questioned by many Norwegian experts. The Swiss Federation recommends 28 days medical suspension for Ermenkov. Golvokin retained the WBA middleweight title by blasting out Ishida in the third dominating the fight all the way. 96-94 twice for Grachev and 96-94 for Erdei in a close, hardfought fight. Jomardashvili was down three times in both the second and third - all from bodyshots. left hook to the body ends matters in this WBC eliminator. Persoon is now a former EBU, WIBF and IBF champ?? Jackson hurt early in the second and again just didn´t recover and he was stopped later in the round. Melis was floored in the third, fifth and sixth before it was called off. 80-71 on all cards. Visic had a point deducted for persistant holding. Cukusic a last minute sub.